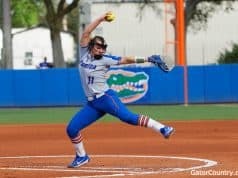 The Florida Gators didn’t have much for the top-ranked Tennessee Volunteers in Knoxville on Saturday. 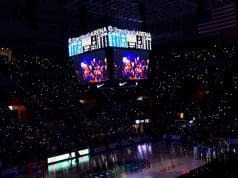 Florida had several chances to get back in the game in both halves, but every time it threatened, Tennessee reasserted itself as the better team. 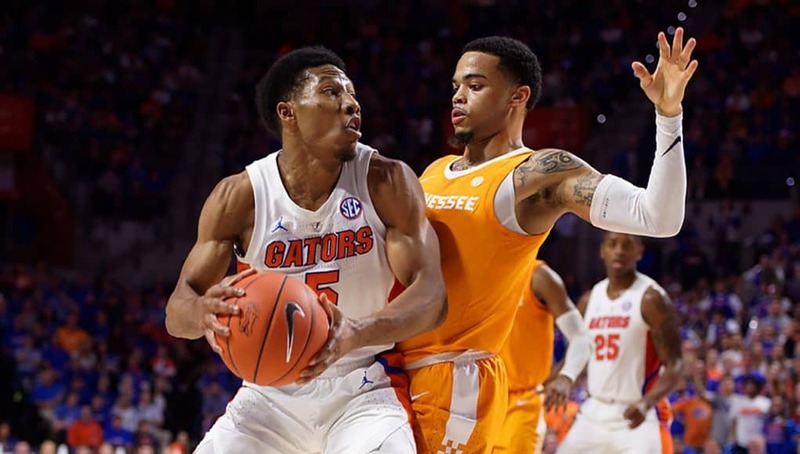 The Vols outlasted the Gators for the second time this season and picked up their 18th consecutive win while handing Florida its third consecutive loss in a 73-61 final. The Gators couldn’t take advantage of a strong defensive start with the Vols missing their first five shots. Florida only got out to a 3-0 lead in nearly three minutes without a score from Tennessee to open the game. It was 8-7 Florida five minutes in, but Tennessee went up 9-8 on a pair of free throws and would never trail again. Keyontae Johnson got in early foul trouble with two by the 15:14 mark. 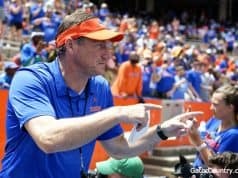 He had to ride the bench the remainder of the first half, and that really came back to bite the Gators. The Vols jumped out to an eight-point lead just a few minutes later. Then, they used an 8-0 run to double up Florida’s score 32-16 with 4:41 to go in the half. A three-pointer from KeVaughn Allen ended the drought and sparked a comeback for the Gators. Jalen Hudson and Kevarrius Hayes traded trips to the foul line and a couple layups to bring it back within nine points. Allen drained another triple with a minute left in the half to cut what was once a 16-point deficit down to six. A Tennessee turnover opened the door to bring it even closer before halftime, but Allen just missed on a drive to the basket. Still, the Gators trailed just 36-30 when it could have been much worse at that point. The Vols pushed their lead back to eight twice in the first minutes of the second half, but Johnson’s return to the game proved huge as he answered both times. The first came on one of his signature slams and the second came on a put back layup after he grabbed two offensive rebounds to keep the possession alive. Hayes got a block on the other end and a layup from Andrew Nembhard made it 40-36. As mentioned before, Tennessee always had a way of pushing itself back into a comfortable place. A 12-2 run by the Vols made it 52-38 with 12:19 remaining. Jalen Hudson hit a jumper to finally halt Tennessee’s momentum, and again, things started swinging back in Florida’s favor. Back-to-back steals from Nembhard and Johnson resulted in a fast break layup by Jalen Hudson and a three by Noah Locke. That forced the Vols to call a timeout with the game back within reach for the Gators at 52-45. The 9-0 Tennessee run that followed let all the wind out of Florida’s sails. A demoralizing dunk by Admiral Schofield with 8:49 left in the game may have been the final straw. While the rest of Florida’s offense struggled to close out the game, Locke was just waking up. He drained three more late three-pointers, but with little help from the rest of the team and the Vols having their way offensively, all it did was make the final score a little easier to look at. Locke finished as the leading scorer with 17 (6-for-10, 5-for-8 from deep). Hudson got himself going a little bit with 15 points. Allen had 11, but scored just a couple in the final 20 minutes. Meanwhile, Tennessee shot 53 percent in the game and had four double figure scorers, led by Williams (16) and Schofield (14). The Gators are the worst rebounding team in the SEC while the Vols sit near the top, but Florida won the battle of the boards in this one 33-31. It had a 15-8 advantage in offensive rebounds, yet only scored four more second chance points than Tennessee. The Gators will get a short break from the road as they return to Gainesville in a must-win situation. A loss to Vanderbilt on Wednesday would be detrimental for remaining postseason aspirations.